Objective To determine whether internists' attitudes toward the hospitalist model change after implementation of a new inpatient service. Design Cross-sectional surveys performed in 1998 and 2000. Setting Tertiary care hospital in Boston, Mass. Subjects A total of 236 internal medicine board-certified physicians affiliated with Beth Israel Deaconess Medical Center. Main Outcome Measures Responses to survey items regarding attitude toward inpatient care and the hospitalist model. We used multivariable models to determine factors associated with physician responses. Results Of physicians surveyed in 2000, 236 (69%) responded; 145 (61%) had also responded in 1998. The mean (SD) age of respondents was 46.4 (10.8) years; 157 (66.5%) were male; and 146 (61.9%) were primary care providers. In 2000, more physicians agreed that "caring for inpatients is an inefficient use of my time" (P<.001), and that "use of a hospitalist service improves quality of care" (P = .002). In 2000, more physicians disagreed that "use of a hospitalist service diminishes physician career satisfaction" (P<.001), and that "use of the hospitalist service adversely affects the physician-patient relationship" (P<.001). No differences were detected in responses to questions regarding patient satisfaction or overall career satisfaction. In multivariable models, older physicians were more likely to favor the hospitalist model; those with busier inpatient practices were more negative (P<.05 for each). Physician specialty or being a primary care provider was not associated with attitudes toward the hospitalist model. Conclusions Following experience with a hospitalist system, physician attitude, including concerns regarding career satisfaction and relationships with patients, toward a voluntary hospitalist model improved. Future research should investigate whether the hospitalist model affects patient satisfaction and quality of care. CARING FOR hospitalized patients has become increasingly complex, as physicians struggle with pressure to decrease length of stay in the face of increased patient acuity and rapidly evolving diagnostic and therapeutic technologies. Meanwhile, physicians' outpatient workload has increased. The hospitalist model was proposed as an adaptation to relieve pressures on clinical practice, and it has recently proliferated widely despite few data on its implications for patients or their caregivers. To date, no studies have linked individual physician's sentiments before and after they have direct experience with a hospitalist system, or how hospitalist systems may affect specific elements of physician practice. For example, how does implementing a hospitalist service affect physicians' impressions of their ability to stay abreast of changes in internal medicine or their sense of efficiency in the outpatient setting? This study takes advantage of a unique situation where we were able to survey a group of physicians before and after implementation of a hospitalist service using a questionnaire with previously tested content.11 By linking responses from the 2 surveys, we were able to directly assess changes in physicians' attitudes, and determine whether physician characteristics such as age, practice type, or specialty are associated with any differences perception of the hospitalist model after implementation. Beth Israel Deaconess Medical Center (BIDMC) is a 591-bed tertiary care academic medical center located in Boston, Mass. The hospital has 2 physically separate campuses 2 blocks apart. All medical patients at BIDMC are admitted to teaching medical services where house staff write all orders and provide 24-hour coverage to all patients. At the time of the first survey (completed in June 1998), a hospitalist service was not available at BIDMC. In July 1998, a large medical practice group hired a hospitalist to provide inpatient care to its inpatients on a voluntary basis. Nearly simultaneously, the Department of Medicine at BIDMC implemented a hospital-based, voluntary hospitalist service to care for patients of other physicians. By the time of the 2000 survey, 8 hospitalists were providing 7-day availability of inpatient care services at BIDMC. Using administrative databases, we identified all board-certified internal medicine physicians with admission privileges at BIDMC. Physicians were eligible for the survey if they had had at least one admission in the 5 months prior to August 1, 2000. To ensure that data did not include emeritus physicians or physicians otherwise improperly identified, we manually screened physician lists. Using this method, 352 physicians were determined to be eligible for the survey. To ensure comparability of results, the majority of questions used in the 2000 survey were drawn directly from our 1998 study.11 Survey items were developed in a 3-step process. First, investigators (A.D.A., R.S.P.) identified domains of physician attitudes and generated an initial list of survey items. Items were then evaluated, modified, or discarded and additional items were created after being posed to groups of active clinicians and experts in survey design in a focus group setting. Finally, we pretested the survey on a small sample of active clinicians not affiliated with BIDMC. In the pretest, physicians were asked to write free-form comments regarding their interpretations of survey items to evaluate construct validity. Using similar methods, a few additional items intended to assess specific aspects of the hospitalist model were developed for the 2000 survey. Between August and December 2000, we performed a mail survey of eligible physicians. Questionnaires were sent to physicians with an accompanying cover letter explaining the academic intent of the study and assuring confidentiality of its findings. Each survey and cover letter contained a confidential, unique physician identification number used only for tracking responses and for data management during the analytic phase. Two follow-up mailings were sent to nonresponders; after the third mailing, physicians who had still not responded were sent an e-mail reminder and sent an additional survey if they were willing to participate at that time. Data from the 1998 survey were available for this study. The 1998 survey used identical methods for identification and contact of candidate physicians via mail; the response rate for this survey was 66%.11 Using unique physician identifiers, 1998 data were linked to 2000 results. Administrative databases were used to collect physician practice information such as specialty and number of inpatients admitted under their care. These data were used to check for possible differences between responding and nonresponding physicians. We used descriptive statistical methods to characterize physician responses to survey items. Answers to 10 items highly correlated in the 1998 survey were reexamined using univariate Pearson correlation techniques. One additional item was excluded from the summary score as indicated by examination of internal consistency of the scale (Cronbach α). We subsequently tested highly correlated items from the 1998 and 2000 surveys using factor analysis to ensure construct validity. Using this method, 9 items included in both surveys were identified as being correlated with physician attitude toward the hospitalist model. Using these items, we generated a summary score intended to more sensitively measure physician attitudes toward the hospitalist model. Items intended to measure physician attitude were first analyzed with Spearman correlation analyses; highly correlated items were then examined using factor analytic methods. Through the combination of these methods, we selected a core group of 9 questions for the summary score. The summary score was a 0-100 point scale that provided a comprehensive measure of physician attitude toward the hospitalist model. The scale was chosen because it lends itself to analysis in multivariable statistical models more easily and provides a more reliable measure of attitude than results from a single question.12 To create this score, some questions were recoded to maintain a consistent attitude valance ("positive" or "negative"). The sum of questions intended to measure negative attitude were then subtracted from the sum of positive attitude questions to produce a scale of ranging from –15 to +30, with lower scores representing a less favorable attitude. Using automated forward and stepwise selection techniques as well as manually entered variables, we fit multivariable mixed effects models that permitted clustering of effects within physicians to determine physician demographic and practice characteristics correlated with changes in attitude toward the hospitalist model of care. We selected items based on the statistical significance of their association with the outcome, observed confounding with other independent variables, or to maintain the face validity of the model. Of 352 questionnaires mailed, 250 were returned. Fourteen of these were discarded: 7 (2.0% of total survey sample) because the physician was a hospitalist and therefore was not eligible, and 7 (2.0% of total survey sample) were undeliverable and returned to the investigators unopened. These surveys were considered mailed to misidentified (and therefore ineligible) physicians. Thus, the response rate was 236 of 338, or 69.8%. Of these 236 respondents to the 2000 survey, 145 (61.4% of respondents, 42.9% of mailing) had also provided responses to the 1998 survey. According to administrative data, respondents and nonrespondents in 1998 were not different in terms of primary care provider status (as recorded in BIDMC databases) or practice location. However, physicians in procedural specialties were less likely to respond in 1998 (P = .03). In 2000, primary care provider status and practice location data were not available administratively, but respondents and nonrespondents had similar numbers of admissions in the previous 5 months (17.5 vs 13.1, P = .13). Similarly, there were no statistical differences in physician specialty between responding and nonresponding physicians in 2000. Physician and practice characteristics are shown in Table 1. The mean (SD) age of respondents was 46.4 (10.8) years, and most (n = 157, 66.5%) were male. Ninety-one physicians (38.6%) reported that their only board certification was in internal medicine. Of subspecialties, cardiology (n = 29, 12.3% of respondents) was the most common additional certification held. More than half of respondents reported they performed inpatient consultations as part of regular clinical practice, and most (n = 146, 61.9%) considered themselves primary care providers. Physicians who performed procedures, worked part-time, or who spent most of their time in nonclinical work were in the minority. Most physicians (n = 147, 62.3%) spent more than 20 hours providing outpatient care each week. In contrast, 131 (56.6%) reported spending 3 or fewer hours in inpatient care during an average workweek. Most admitted patients to both campuses of BIDMC. In 2000, more than half of the physicians continued to provide all care for their inpatients, but more than one quarter used a hospitalist service for all or some of their patients (Table 2). Of physicians who used a hospitalist for all or some of their inpatients, the majority used the hospitalist service provided by BIDMC. A majority of respondents (53.2%) reported starting to use the service in 2000, one year after implementation of the hospital-based service and 2 years after the group hospitalist service became available. Of physicians who used the hospitalist service for fewer than 100% of their patients, most used the hospitalists for fewer than one quarter of their patients. Most were satisfied or very satisfied with the hospitalist model. Of physicians who elected to use the hospitalist service for some of their patients, 44.8% said they chose to use a hospitalist when they were unable to see the patient themselves. Nearly one third (31%) said they decided to use a hospitalist when their patient required care outside their area of expertise. Approximately one quarter used hospitalists when the patient required close attention or when they did not know the patient well. Few, however, chose to use a hospitalist service based on their relationship with the hospitalist or the patient's insurance. The majority of physicians stated they used the service because it permitted greater efficiency in the outpatient setting, or because it provided additional time for other activities. Few physicians (n = 7, 11.3%) reported that their use of the hospitalist system was mandatory, or that they received incentives to admit patients to the hospitalist service. Table 3 displays responses to questions about sentiment regarding inpatient care and the hospitalist model from physicians who provided usable answers to "attitude" questions in both the 1998 and 2000 surveys. Lower scores indicate agreement with the statement (1 = strongly agree, 2 = agree) and higher scores indicate disagreement (4 = disagree, 5 = strongly disagree). After implementation of a hospitalist service, more physicians felt that "caring for hospitalized patients is an inefficient use of my time," and fewer agreed that inpatient care "was best directed by the physician who has a long-term relationship with the patient." There were no changes in physician impressions of their ability to stay up-to-date with medical knowledge, comfort with providing inpatient care, or career satisfaction. Not surprisingly, physicians were more likely to report familiarity with the hospitalist model after implementation. This paralleled a marked increase in agreement with the statement "a hospitalist service is needed at BIDMC." Fewer physicians felt the hospitalist model was a "passing fad." Although these questions were not asked in 1998, respondents in 2000 were generally neutral regarding hospitalists use of consultants or hospitalists' teaching ability. When asked about the hospitalist system's impact on their practice, there was a marked increase in agreement that the hospitalist service allowed more time for physicians to "pursue other interests." Far more disagreed that "use of a hospitalist service diminishes career satisfaction." However, there was more concern that hospitalist model would reduce physician income. Over time, more physicians agreed that hospitalist services reduced hospital costs, and that inpatient care quality was improved. Although there were no differences in reports of impact on patient satisfaction, more physicians disagreed that "use of a hospitalist service adversely affects the physician-patient relationship." We generated a summary score of physician attitudes toward the hospitalist model of care using 9 highly correlated items from the questionnaire (Table 3). Cronbach α for the 1998 items in the summary score was .87, and for the 2000 items was .85, indicating a high degree of internal consistency. Factor analyses of these 9 items showed that all items loaded positively on the first variable, and no additional underlying constructs were measured by these items. Between 1998 and 2000, there was a 3-point increase in score, representing a more positive attitude toward the model over time. Using multivariable mixed effects models to allow grouping within respondents, we determined practice and physician factors associated with attitudes toward the hospitalist model of care as measured by the 2000 summary score (Table 4). In multivariable models, older physicians and those who used a hospitalist for all or some of their patients were more likely to have a favorable attitude toward the hospitalist model of care. Physicians with busier inpatient workloads had a less favorable attitude. Other physician factors, such as specialty, whether they considered themselves a primary care provider, worked on a part-time basis, or level of outpatient workload were not statistically associated with 2000 summary score. To examine the possibility of response biases, we compared summary scores of physicians who responded to 1998 and 2000 surveys with those from physicians who responded in 2000 only. These analyses revealed no statistical difference in 2000 summary score between these 2 groups. We also examined multivariable models that sought to determine physician and practice characteristics associated with change in summary score between 1998 and 2000. After adjustment in multivariable models, no physician demographic, specialty, or practice factors were independently associated with change in attitude toward the hospitalist model, as measured by the summary score. Additional analyses sought to determine factors independently associated with generalist physicians' reports of using hospitalists for their inpatients. After adjustment in multivariable models, no generalist practice or training factors were associated with use of hospitalist services. After implementation of a voluntary hospitalist system at this tertiary care teaching hospital, physician attitudes toward the hospitalist model improved. The most positive changes were noted in questions about perceptions of the model's effects upon career satisfaction and relationships with patients. Physicians also felt more positively concerning the model's impact on quality of care. However, physicians reported more concern regarding changes in physician income. In multivariable models, older physicians were more positive toward hospitalist systems, while those with busier inpatient practices had a less favorable attitude. Previous studies suggest that physicians with hospitalist models available in their community view it more favorably.9,10 However, our study is the first to directly assess the impact of hospitalist systems on practicing physicians. In contrast to numerous letters and articles decrying the potential impact of hospitalist systems on patients and physicians,13-21 results from our investigation provide empiric data to guide the ongoing debate. Our findings suggest that physicians believe the hospitalist model improves their ability to provide efficient outpatient care. While firm evidence supports claims of increased efficiency of inpatient care,1,3-8,22,23 the hospitalist model was also proposed as a means to improve outpatient care efficiency through separation of competing hospital and clinic responsibilities.24 Although responses in our survey suggest that physicians have more time for outpatient practice, little information exists to describe in how hospitalist systems affect outpatient care efficiency. Other authors have speculated that the emergence of the hospitalist model may further divide generalist physicians into inpatient-based and office-based physicians, or "officists. "32 Results from our survey suggest that, at least in a voluntary hospitalist system, physicians may adopt this differentiation willingly. In our cohort, physicians increasingly reported that inpatient care was an inefficient use of their time and that the hospitalist service allowed them to pursue additional interests after implementation of the hospitalist model. Our results allay concerns that the hospitalist model might reduce physician career satisfaction.13,14,33 Although there were no significant changes in physicians' reports of their ability to keep up with medical knowledge or overall career satisfaction, they responded significantly more positively to questions regarding the model's impact upon their professional career. However, physicians in our cohort voiced concern about the impact of hospitalist systems on their income. This finding has not been observed in other studies of physician perceptions of the hospitalist model,9,10 and it is not easily explained from our data or from closer examination of the reimbursement systems at our study site. Mandatory hospitalist models have been decried in the literature28,34,35 and are uncommon nationwide.9,10 It is unclear what physicians who reported a "mandatory" system at BIDMC understood about the hospitalist program, and our data cannot explain the cause for this perception. While it is possible that practices that used "rotating" systems may have contributed to this perception, during the time of our survey there were no hospitalist services that were obligatory for any BIDMC-associated practices. Use of the service was not associated with any incentives or disincentives for outpatient physicians, and physicians could admit patients to the service according to their preferences. In fact, our data suggest that the majority of physicians who used hospitalist services continued to provide inpatient care to many of their patients. Results from our multivariable models of 2000 results are consistent with our 1998 study in that physicians with busier inpatient workloads had a more negative attitude toward the hospitalist model. These physicians may represent a population of practitioners who feel most comfortable in the inpatient setting and feel less of a need for hospitalist services. In contrast to our previous study, in 2000 we observed that older physicians have a more favorable impression toward the model, after adjusting for workload and specialty. These physicians may be more willing to relinquish inpatient care because of additional nonclinical duties, or decreased comfort with the inpatient setting; however, we cannot examine these hypotheses using our data. We noted no trends in attitude associated with specialty, unlike previous studies in which inpatient-focused subspecialists had a negative attitude toward hospitalists, perhaps due to concerns about less frequent consultation.9 Interestingly, we could discern no independent predictors of change in attitude over time. This might imply a global improvement in attitude toward hospitalist systems at our site, but few other inferences can be made. This study has several limitations. As a cross-sectional survey of physicians associated with a large, tertiary care facility, our findings may not apply to other sites with different hospitalist systems. Because the survey asked about physician experiences in the time prior to the survey, it is subject to recall biases. However, we specifically focused our 1998 and 2000 survey questions so that physicians would consider only their current practices and sentiments. Although our study may have been subject to response biases, there were few differences between respondents and nonrespondents. In addition, our study design allowed for direct comparisons of respondents' answers to the 2 surveys, further minimizing biases. Findings from our study help lay to rest many of the physicians' early concerns regarding the impact of the hospitalist model on their practice and their patients' satisfaction. 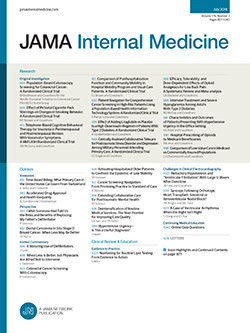 Rather than reducing physicians' satisfaction with overall practice, negatively impacting physicians' relationships with patients, or reducing physician perception of patient satisfaction, our results suggest that implementation of a voluntary hospitalist system is associated with improved perception of the quality of inpatient care, improved attitudes toward the hospitalist model, and gradually increased use of hospitalist services over time. This finding appears to be due, in part, to the flexibility of the voluntary system and the perceived benefits of the model in terms of clinical efficiency in the outpatient setting. Rapid growth of hospitalist systems and the large potential workforce demand for inpatient-based physicians36 have the potential to markedly impact physician practice. Our results, especially if reproduced in diverse settings, would indicate that physician attitude is unlikely to negatively influence growth of hospitalist systems. Although future research should seek to determine the model's true impact on quality of care and patient satisfaction, this study adds to a growing body of literature suggesting that use of a voluntary hospitalist model may improve rather than detract from physician practice and patient experience. Corresponding author and reprints: Andrew D. Auerbach, MD, MPH, Department of Medicine, University of California San Francisco, Box 0131, San Francisco, CA 94143. We would like to acknowledge Robert Wachter, MD, for his suggestions regarding the manuscript and Erin Hartman, BA, for invaluable editorial support.